Keep your backyard and family free of fleas, ticks, and mosquitoes. Modern’s HomeCare Vector Mosquito & Tick Control Service includes targeted treatments for long-term prevention of disease carrying pests. 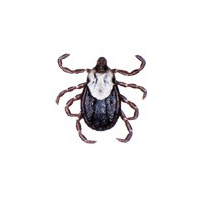 The black-legged, or deer, tick (Ixodes scapularis) is named for its black legs. Its body is pale in color, and can be recognized by the small size and reddish dorsal area. Females have a shorter dorsal plate and a tear-drop shape. Males are smaller with a round dorsal plate that covers most of their body. 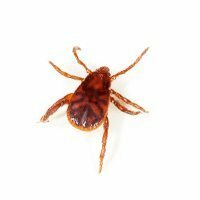 The mouthparts of the female black-legged tick are longer than the male and longer than the American dog tick. The larval tick is no bigger than the size of the period at the end of this sentence. Black-legged ticks live in grass and shrubs. They attach to hosts through “questing”, which means waiting for an appropriate host to pass by and then latching on. The adult female will lay 2,000-18,000 eggs on the ground. Deer are important to maintaining black-legged tick populations because they transport them to different areas. However, deer don’t actually become infected by ticks. Ticks feed on the blood of their host. Larva tend to feed on small animals. Nymphs also feed on small animals, but sometimes on humans as well. Adult ticks tend to feed on whitetail deer and humans. 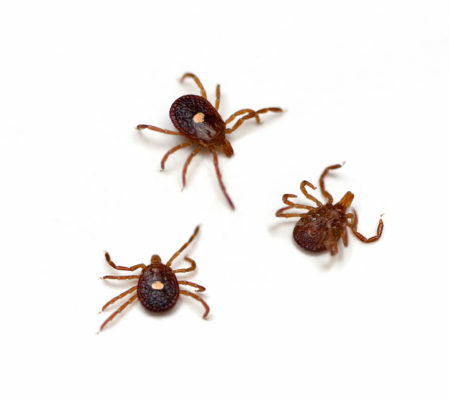 Ticks have a three-host lifecycle over the course of two years. They have a blood meal between each, with an increasingly larger host. The three feeding stages are larva, nymph, and adult. The larvae hatch in the summer and feed on mice and other small animals, including birds. 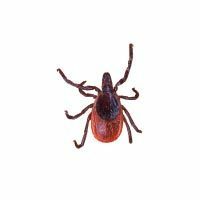 A young tick can take in bacteria from an infected host and remain infected for the rest of its life. When the tick feeds again as a nymph, it can transmit this bacteria to its new host, which potentially be a human. Our Homecare Vector Program is proven to effectively reduce tick, flea, and mosquito populations! Get a quote or schedule service today!